Rainer Gross’s early photo-paintings were still indebted to the zeitgeist: the proximity to Gerhard Richter cannot be overlooked. 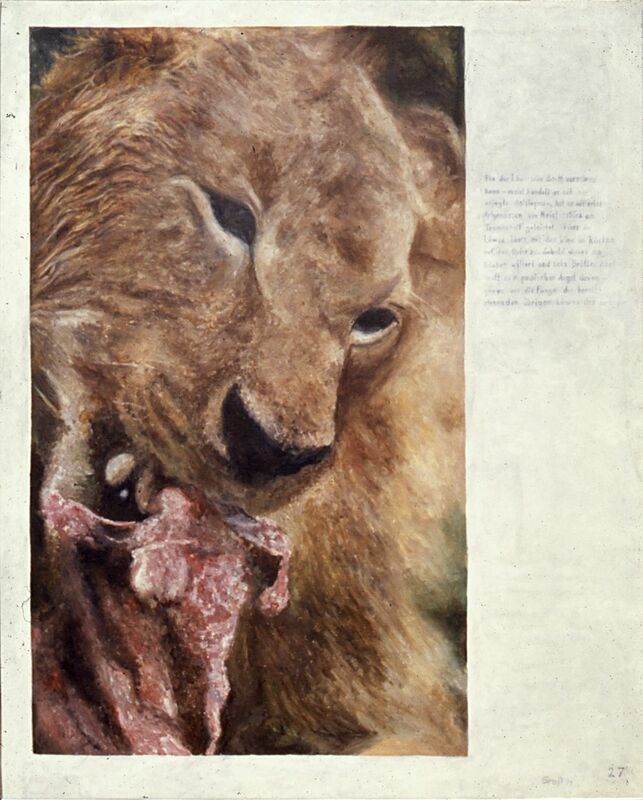 Thus, for example, the Lion of 1971 is reminiscent of Gerhard Richter’s Tiger of 1965, both in its subject and in its obvious quoting. It is worth noting that, also in 1971, Gross painted a black-and-white picture based on a photograph of a Beuys performance. 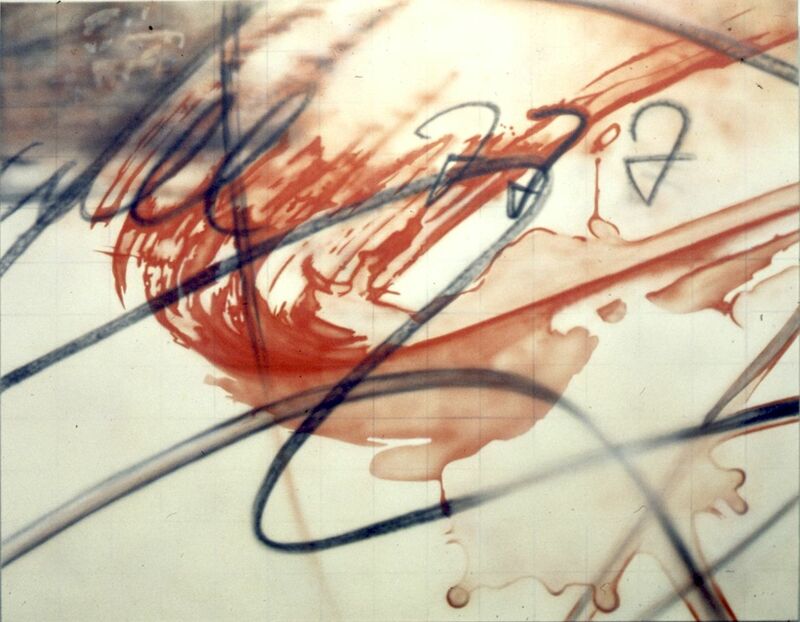 Measuring 150 by 200 cm, it was an ambitious format, showing how important grappling with Beuys actually was for the aspiring painter, who along with his colleagues had made the conscious decision “to paint realistically at a time when nearly all of our fellow students were striving to emulate Francis Bacon with abstract expressive paintings.” 1971 was the same year in which Beuys’s politicization of art entered a decisive phase: On 1 June he founded in Düsseldorf the “Organization for Direct Democracy through Referendum,” and he staged a “street performance” later that month on the High Street in Cologne, handing out shopping bags with his organization’s platform printed on them and discussing it with passersby. Rainer Gross was there as a spectator; the fact that he reacted to this performance with painting is telling. The act of copying newspaper photographs is a reflection upon the degree of reality a picture can contain. 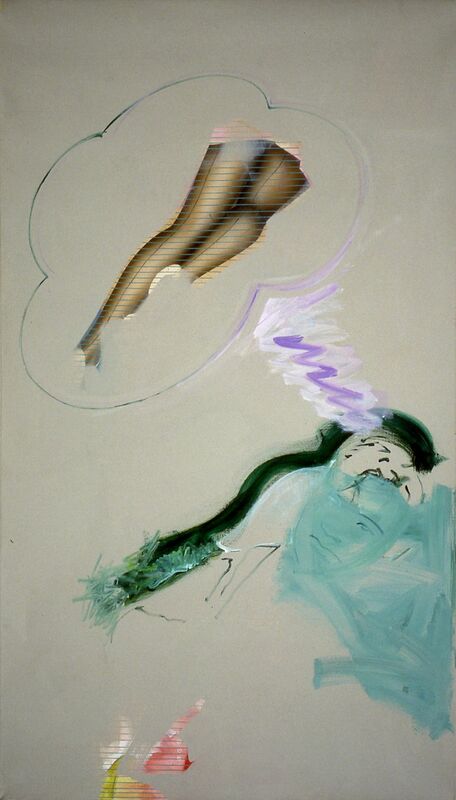 Idi likes it, created in 1972, is conceptually the most ambitious painting of Rainer’s Gross’s early phase. 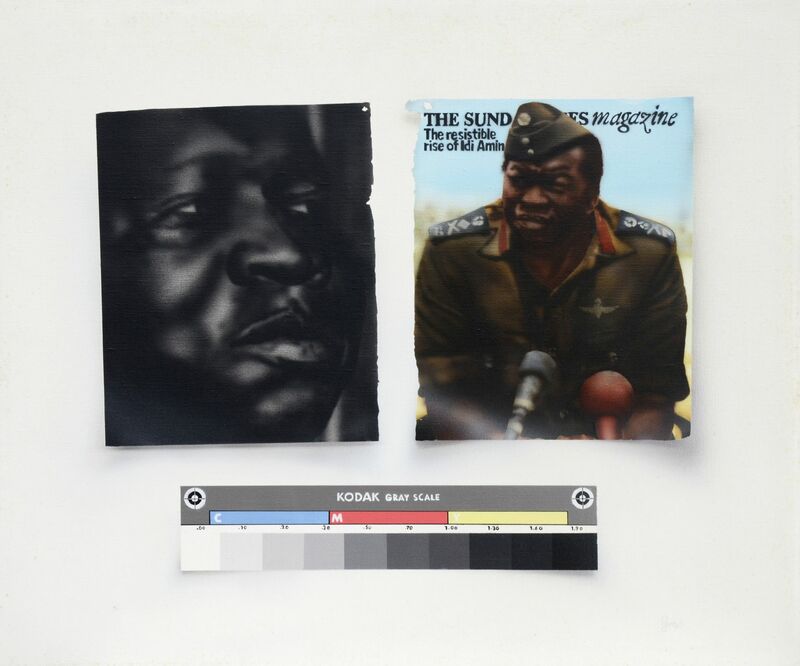 Using the airbrush technique he had learned from Howard Kanovitz, Gross first painted copies of two magazine photographs of the Ugandan dictator Idi Amin, who had come to power in a coup d’etat on 25 January 1971, then placed a spectrum of gray tones (such as he had learned to make with Hubert Schaffmeister) beneath them, the kind you use for calibration in offset printing when you reproduce paintings. The joke of the painting is that the Idi Amin portraits, which are clearly recognizable as magazine clippings, do not need this, since why would you want to do a photographic reproduction of a photograph? The gray scale is for the painting itself. It is a signifier, internal to the picture, painted into it in advance, of a process external to the painting (its photographic reproduction). Even though this type of conceptual photo painting was just a passing early phase, the complex enmeshing of image and reality at various levels would have a great future in Gross’s oeuvre. 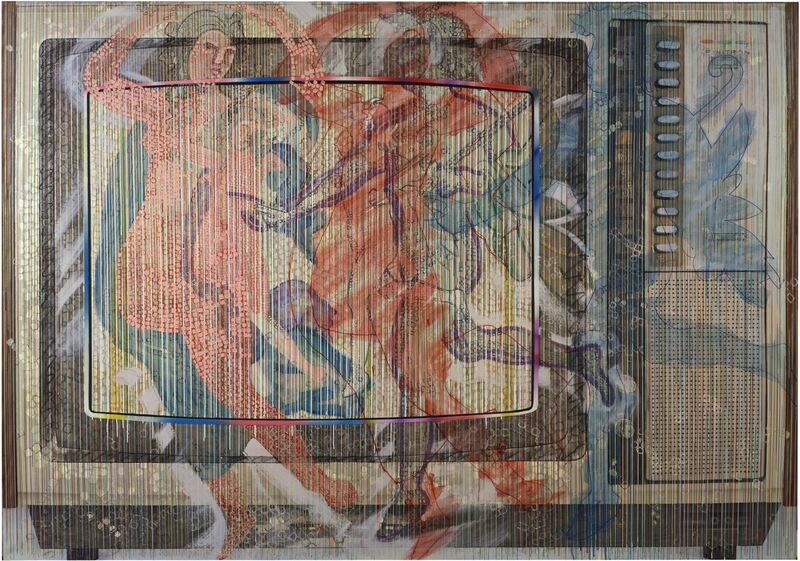 Also forward-looking, at least with respect to a certain portion of his work, is Irgend etwas im Kleid selbst (Something in the Dress Itself), a painting made in New York in 1974, which likewise displays strong echoes of early paintings by Gerhard Richter. The magazine clipping that has been reproduced here may be identified as a page from Der Spiegel. It is a copy of a curious memo from Howard Hughes, in which the film director and businessman dictates the way Jane Russell’s breasts are to look and the kind of bra she is to wear in the 1943 film “The Outlaw”. Irgend etwas im Kleid selbst, with its image of the seductive Russell, constitutes the first of Rainer Gross’s erotically charged paintings. This theme would be central to his work for several years. The fact that these were not painted copies of film beauties in the Pop Art style, but rather harked back to the Baroque, in particular to the painting of Peter Paul Rubens, could not have been foreseen in 1974. 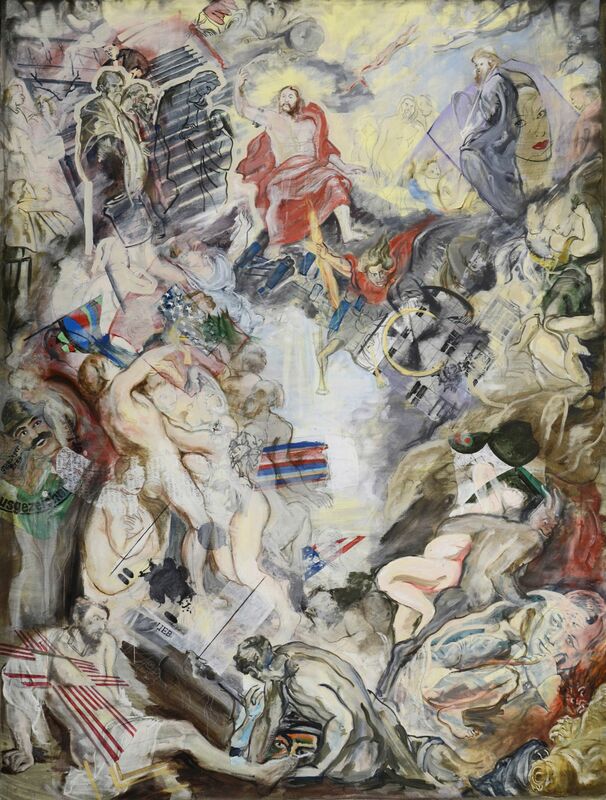 It should come as no surprise that while he worked as an assistant to Howard Kanovitz and Larry Rivers, Rainer Gross had little time to devote to his own painting, especially since he was also playing drums in a New York punk band back then. The paintings in his early phase reveal a correspondingly disjointed development. But what the works do clearly display is a quickly perfected command of craftsmanship, an ability to swiftly incorporate foreign idioms. “It was effortless for me to change from one style to another,” Gross says. 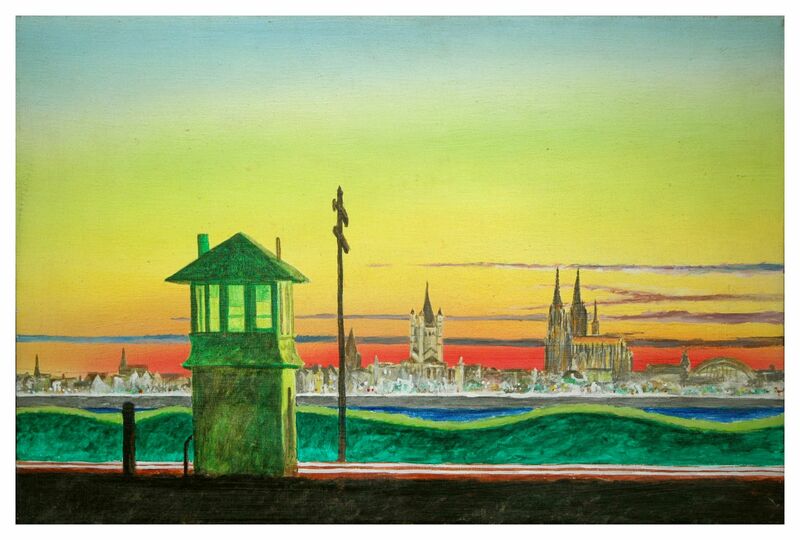 This is easy to understand when, for example, he takes Edward Hopper’s “Railroad Sunset” of 1929, in the collection of the Whitney Museum in New York, and moves it to the Rhine, painting the Cologne City panorama with the unmistakable towers of the Cathedral and the Church of Great Saint Martin against the glowing colors of the fiery evening sky: Hopper’s Cologne. 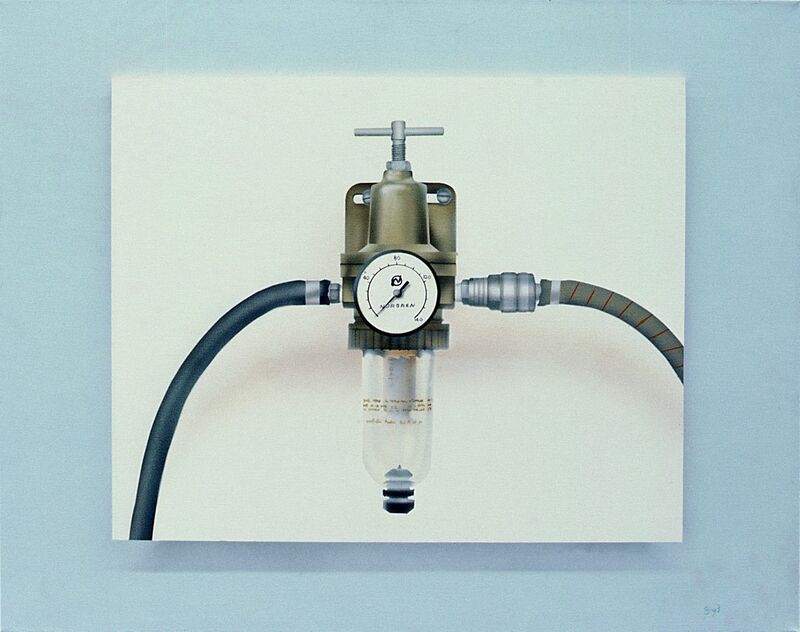 But above all, the early Rainer Gross makes forays into the different variations of photorealism. This is apparent when we compare such very different paintings as Portrait of a Brushstroke, 1974, and Map and Scissors, made the year after that. 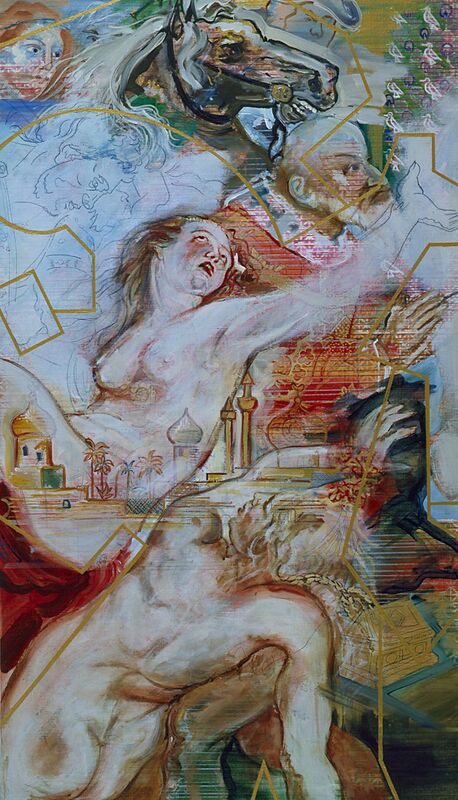 In the first work, again painted in airbrush technique, Gross takes up the well-known theme of a seemingly spontaneous, energetic brushstroke, imitating it in an entirely different idiom. Roy Lichtenstein had already done this with his “Brushstrokes” in the mid-60s using the medium of the heavily outlined, comic-strip-like pseudo-printing screen. A few years after Rainer Gross, Gerhard Richter was to elevate his “Stroke (on Blue)” and “Stroke (on Green)” of 1978 and 1980 to a monumental format 20 meters in length. As for Map and Scissors, it shows a scissors hanging on a nail that has been driven into a map of Manhattan. The scissors, at least in retrospect, seems to point to the ties Rainer Gross cut when he decided not to return to Europe, but remain in the US for good. Louisville Slugger from 1977 is Rainer Gross’s first major work. The square format measuring 2.44 by 2.44 meters shows the demands the painter is placing upon himself. 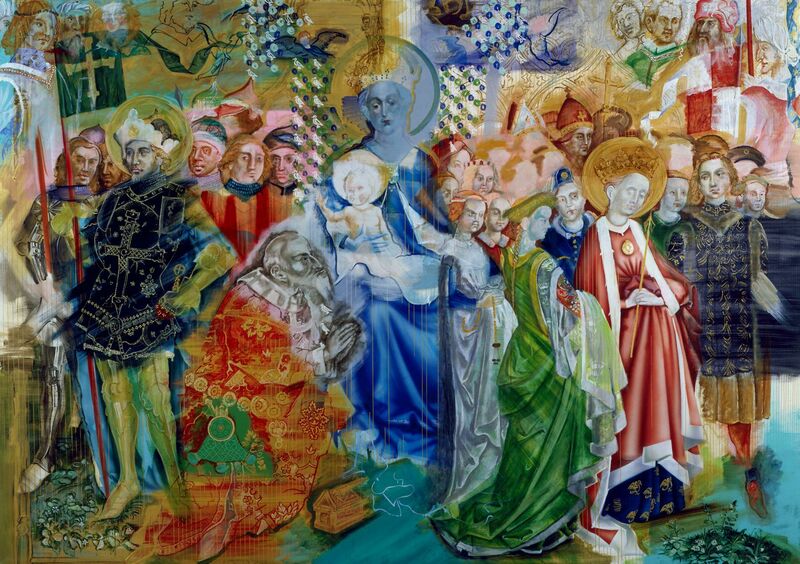 With nearly 6 square meters of surface, it is by far the largest of Gross’s paintings thus far. 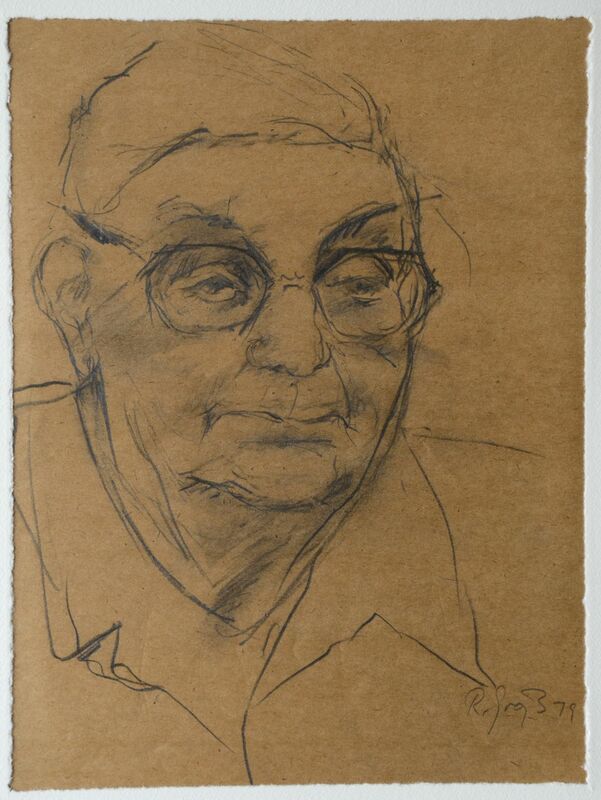 It is a portrait of his stepson Michael, 10 years old at the time, and yet at the same time it is much more than this. As a painting that both documents the technical prowess Gross has attained and also anticipates painting concepts to come, it transcends all genre boundaries, being at once a still life, an interior and even a history painting. The painting is a pastiche of various components and quotes. The boy, wearing the white striped jersey of the New York Yankees, stands there a little shyly, leaning on his “Louisville Slugger”, the legendary baseball bat used by American Major League players, made by the Hillerich & Bradsby Company in Louisville, Kentucky. The young man’s gaze is not on the viewer, but off to the right, his expression serious; his sport socks, which have slid slightly down, suggest that posing is not his priority. Oddly enough, the boy is not on the ball field, but in a bourgeois living room. A set of heavy furniture upholstered in dark green velvet with a floral pattern is arranged around a delicate coffee table made of glass, upon which a bowl of fruit has been placed. Rainer Gross painted the furniture from a mail-order catalogue; the still life with bowl of fruit quotes Cézanne. No attempt is made to disguise the fact that the individual motifs come from different contexts. We need only look at the shadows the pieces of furniture cast, which fall in completely different directions than the shadow of the baseball bat, while the boy himself casts no shadow at all. 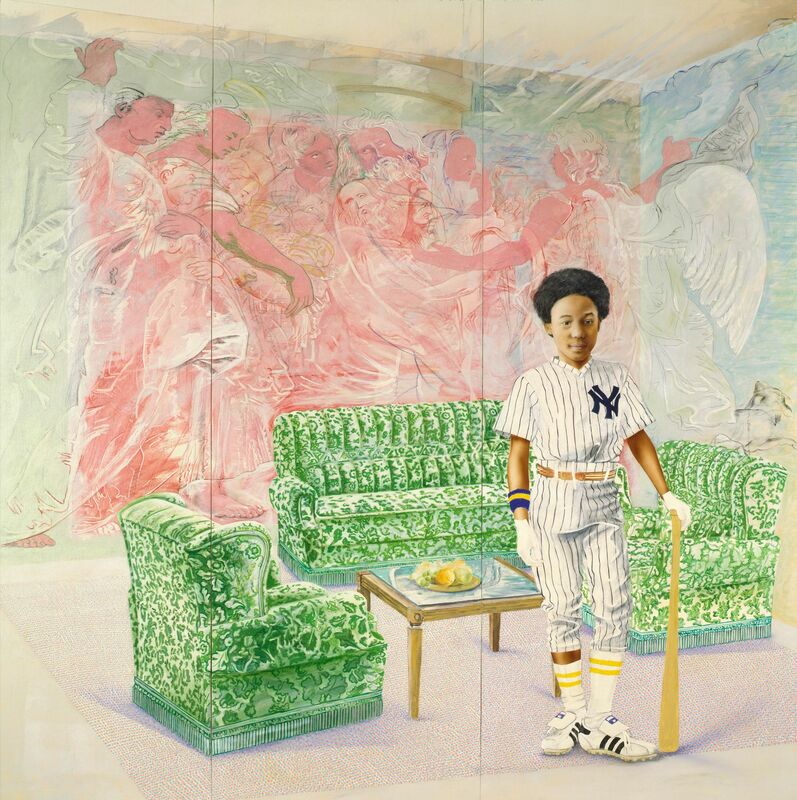 The most striking and disconcerting aspect of the painting, however, takes place behind the boy’s back: there, strangely doubled, here somewhat larger, there in a smaller format, semi-transparent and essentially rendered in pink and white, is an odd group of people. From the left, a young woman with a strong arm enters the action, in the middle a bearded old man turns his head, while on the right, an angel points into the distance. Out of the blue, suddenly Peter Paul Rubens’s painting Lot and his Daughters Fleeing Sodom and Gomorrah (at the Ringling Museum in Sarasota, Florida) shows up in the living room of the Louisville Slugger, laterally inverted and most likely done from an engraving. At first glance, we might think that the Baroque painting is some sort of eccentric photo wallpaper, but upon closer examination, we notice the streaks in the upper right corner, the cloud of fire and brimstone that will destroy the iniquitous Sodom. These streaks extend beyond the corners of the room and keep the biblical painting from being seamlessly integrated into the composition, for instance, as a mural. The Rubens painting creates another level in the picture, breaking up its homogeneity. 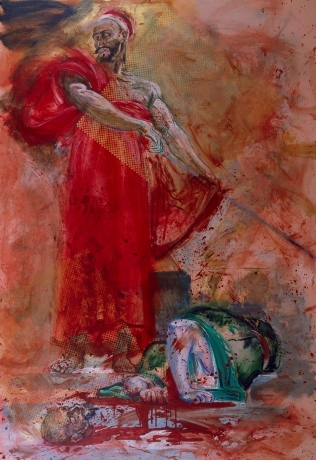 But what does the biblical story of Sodom, destroyed in the storm of fire, and Lot, the Patriarch, whose wife looked back and turned into a pillar of salt (alluded to by the massive pillar shaft in the middle ground of the painting), have to do with the young baseball player and the somewhat stuffy living room? 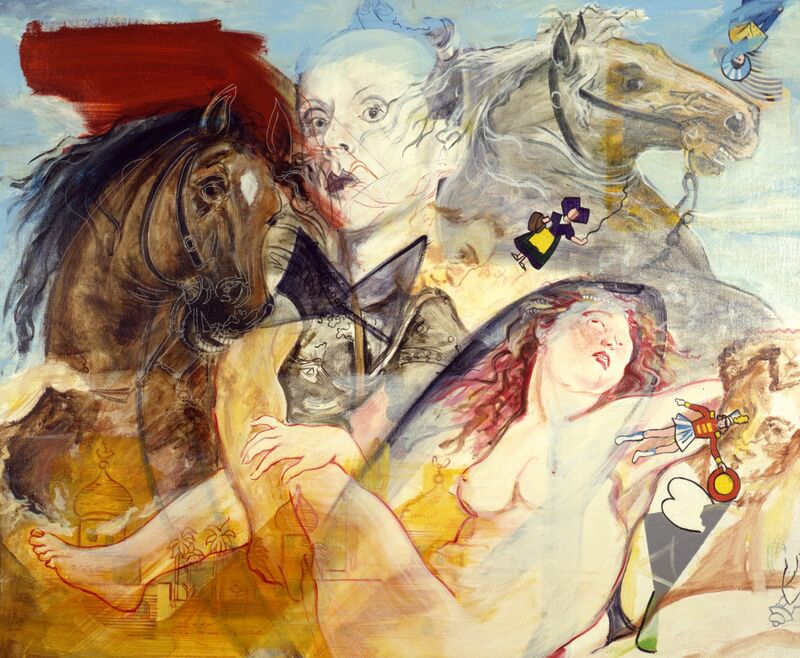 Nothing, at first – and that’s exactly the point: “From there on, complications in the cultural realm become my theme, but still with Rubens in the background – the whole thing was pretty confused, in the paintings as well as in my mind,” says the artist. “Somehow I had to restore the confusion of life to order in the paintings, to piece a shattered world together again.” A biographical interpretation seems apt here: only painting could hold things together that were so hopelessly mixed up in real life – European tradition and American life, past and present, Cologne and New York, Punk and Baroque. Of course, the concern here was about looking backwards, to Cologne, to Europe, and the danger of being frozen that way. 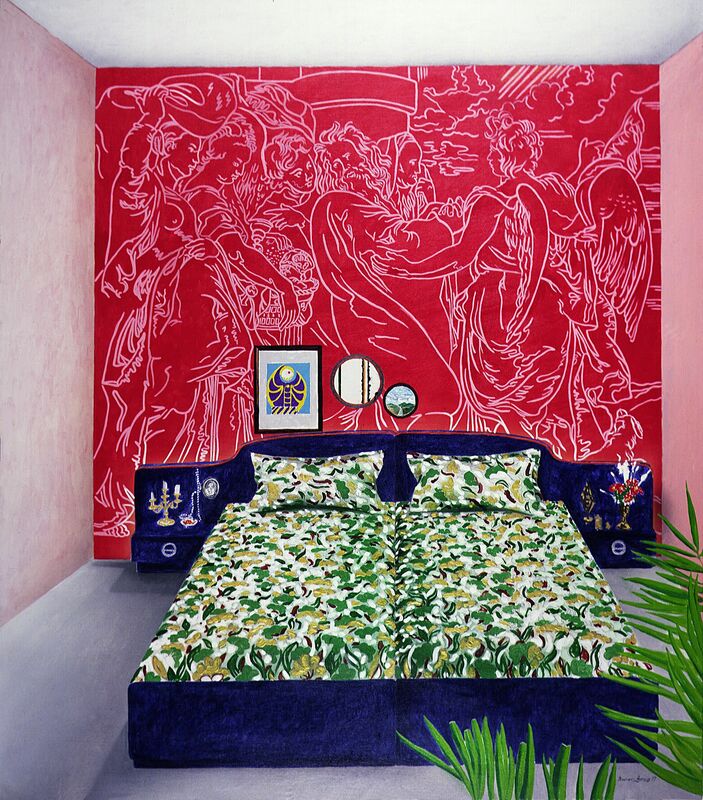 The fascinating thing is that the private confusion of the 26-year-old artist was at the same time symptomatic of a broader cultural conflict that began to preoccupy the art world at the end of the 1970s under the misleading label of “postmodern”. 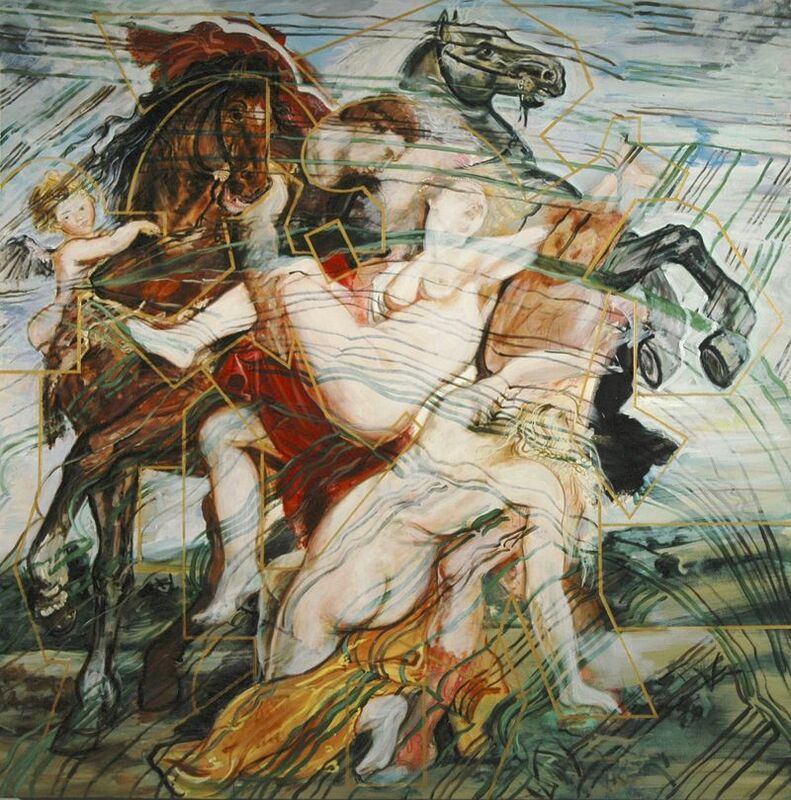 It would not be worth our while here to enter into a detailed examination of what links Rainer Gross’s painting to the Postmodern – first, because despite all of the heated debate, even in the 1980s no clear definition of the concept was ever reached, and second, because the end of the Postmodern has been proclaimed so often that we no longer have much need of the label. If we may agree that the Postmodern Movement designates the artist’s sense that all avant-garde battles have been fought, that the gulf between high culture and “lower” popular culture, including kitsch, has been bridged, and that real artistic innovations are no longer possible – only, at best, new combinations of things that already exist (Rainer Gross spoke of a “recycling” of paintings) – then we may certainly describe Gross’s notion of art, at least in the 1970s and 1980s, as “postmodern”. About his Punk Band, Rainer Gross explains: “It was called LOK (Love’s Outrageous Kingdom). Back then, from 1975 to 1977, we performed at CBGB and at Max’s Kansas City with our own songs, some composed by me, along with the Ramones, the Talking Heads and others. Arthur Kane, aka ‘Killer Kane’, the former bass player of the ‘New York Dolls,’ was a member of the group for a while. An EP came out in England with Fetish Records.” (E-mail to the author, 18 December 2011). Die frühen Foto-Malereien von Rainer Gross gehörten noch ins Pflichtprogramm des Zeitgeists; die Nähe zu Gerhard Richter ist nicht zu übersehen. So erinnert etwa der Löwe von 1971 thematisch und mit seinem offensichtlichen Zitatcharakter an Gerhard Richters „Tiger“ von 1965. Bemerkenswert ist die Tatsache, dass Gross, ebenfalls 1971, ein schwarz-weißes Bild nach einem Foto einer Beuys-Aktion malte. Mit 150 mal 200 cm handelt es sich um ein stolzes Format, was andeutet, wie wichtig eine Auseinandersetzung mit Beuys für den angehenden Maler doch war, der sich mit seinen Kollegen entschlossen hatte, „realistisch malen zu wollen in einer Zeit, in der fast alle unserer Kommilitonen mit expressiv-abstrakten Bildern Francis Bacon nacheiferten.“ 1971 war genau das Jahr, in dem die Politisierung des Kunstbegriffs von Beuys in eine entscheidende Phase ging: Am 1. Juni 1971 hatte er in Düsseldorf die „Organisation für direkte Demokratie durch Volksabstimmung (freie Volksinitiative e. V.)“ gegründet. In engem Zusammenhang damit stand die „Straßenaktion“, die er am 18. Juni in der Hohe Straße in Köln durchführte, wo er Tragetaschen mit dem aufgedruckten Programm seiner Organisation verteilte und mit den Passanten diskutierte. Rainer Gross war damals als Zuschauer dabei; dass er auf die Aktion mit Malerei reagierte, war ein deutliches Statement. Das Abmalen von Zeitungsfotos war eine Reflexion über den Wirklichkeitsgehalt von Bildern. Das konzeptuell anspruchsvollste Gemälde seiner Frühphase gelang Rainer Gross 1972 mit Idi likes it. In Spritzpistolentechnik, die er sich bei Howard Kanovitz abgeschaut hatte, malte Gross nicht nur zwei Zeitschriftenfotos des ugandischen Diktators Idi Amin ab, der sich am 25. Januar 1971 an die Macht geputscht hatte, darunter platzierte er auch eine Grauskala (wie er es bei Hubert Schaffmeister gelernt hatte), so wie man sie beim Abfotografieren von Gemälden als Orientierung für den Offsetdruck verwendet. Der Witz des Bildes besteht darin, dass die beiden Idi Amin-Porträts, die deutlich als Zeitschriftenausschnitte gekennzeichnet sind, einen solchen Streifen gar nicht benötigen, denn warum sollte man diese Fotos abfotografieren? Die Grauskala bezieht sich also auf das Gemälde selbst, sie ist ihm vorab als bildinterner Verweis auf einen bildexternen Vorgang (seine fotografische Reproduktion) hineingemalt. Auch wenn diese Art von konzeptioneller Fotomalerei nur eine vorübergehende Frühphase darstellte, das komplexe Verschränken verschiedener Bild- und Wirklichkeitsebenen sollte in Gross’ Œuvre noch eine große Zukunft haben. Zukunftsweisend, zumindest für einen gewissen Teil seines Werks, war auch Irgend etwas im Kleid selbst, ein Gemälde, das 1974 in New York entstand und ebenfalls starke Anklänge an die frühen Bilder von Gerhard Richter aufweist. Der Magazinausschnitt, der hier wiedergegeben ist, lässt sich als eine Seite aus dem SPIEGEL identifizieren. Es handelt sich um den Abdruck einer kuriosen Aktennotiz des Regisseurs Howard Hughes, in welcher der Regisseur und Unternehmer detailliert das Aussehen der Brüste von Jane Russell und die Beschaffenheit ihres Büstenhalters in dem Film „The Outlaw“ von 1943 festlegt. Irgendetwas im Kleid selbst mit dem Bild der verführerischen Jane Russell ist das erste der erotisch aufgeladenen Gemälde von Rainer Gross. Für mehrere Jahre sollte diese Thematik im Mittelpunkt seiner Arbeit stehen. 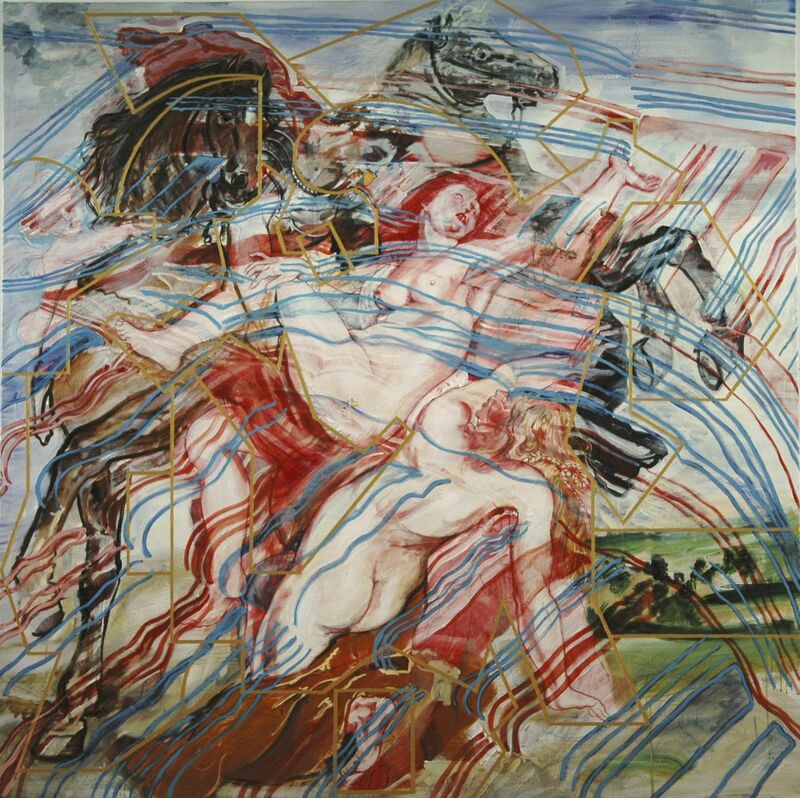 Dass dies nicht im Pop-Art-Format abgemalter Filmschönheiten, sondern im Rückgriff auf das Barock und insbesondere auf die Malerei von Peter Paul Rubens geschehen würde, war 1974 noch nicht absehbar. Es kann nicht verwundern, dass Rainer Gross während seiner Assistentenzeit bei Howard Kanovitz und Larry Rivers nur wenig Zeit für seine eigene Malerei hatte, zumal er zugleich Schlagzeuger einer New Yorker Punk-Band war. Die Gemälde seines Frühwerks zeigen eine entsprechend sprunghafte Entwicklung. Deutlich wird in ihnen eine rasch sich perfektionierende Beherrschung des Handwerks, die Fähigkeit, sich schnell fremde malerische Idiome anzueignen. „Mir fiel es leicht in dieser Zeit, von einem Stil in den anderen zu wechseln“, sagt Rainer Gross. Dies wird nachvollziehbar, wenn er z. B. Edward Hoppers „Railroad Sunset“ von 1929, das sich im Whitney Museum in New York befindet, an den Rhein verlegt und unter dem in leuchtenden Farben aufglühenden Abendhimmel die Kölner Stadtsilhouette mit den unverkennbaren Türmen des Domes und der Kirche Groß Sankt Martin malt: Hopper’s Cologne. Vor allem aber versucht sich der frühe Rainer Gross in unterschiedlichen Varianten des Fotorealismus. Das zeigen im Vergleich so unterschiedliche Bilder wie Portrait of a Brushstroke von 1974 und Map and Scissors aus dem darauffolgenden Jahr. Mit ersterem, wiederum in Airbrush-Technik gemalt, nimmt Gross das bekannte Thema auf, einen scheinbar spontanen, schwungvollen Pinselstrich in einem ganz anderen malerischen Idiom zu imitieren. Roy Lichtenstein hatte das mit seinen „Brushstrokes“ bereits in der Mitte der 60er-Jahre im Medium des stark konturierten, comic-strip-artigen Pseudo-Druckrasters getan; Gerhard Richter sollte wenige Jahre nach Rainer Gross seinen „Strich (auf Blau)“ und den „Strich (auf Grün)“ (1978 und 1980) mit 20 Meter Länge ins Monumentalformat heben. Map and Scissors zeigt eine Schere, die an einem in die Stadtkarte Manhattans eingeschlagenen Nagel hängt. Die Schere, so erscheint es im Rückblick, deutet auf den cut, den Rainer Gross vollzog, als er sich dafür entschied, nicht nach Europa zurückzukehren, sondern dauerhaft in den USA zu bleiben. Mit dem Louisville Slugger von 1977 schuf Rainer Gross sein erstes Hauptwerk. Das quadratische Format, 2,44 mal 2,44 Meter, deutet den Anspruch an, den der Maler hier an sich selbst stellt. Mit fast 6 Quadratmeter Bildfläche ist es mit Abstand das größte Gemälde, an dem sich Gross bis zu diesem Zeitpunkt versuchte. Es handelt sich um das Porträt seines damals 10-jährigen Stiefsohns Michael und zugleich um sehr viel mehr als ein Porträt. Als ein Bild, das nicht nur die mittlerweile erlangte technische Meisterschaft von Gross dokumentiert, sondern auch auf die kommenden Bildkonzepte vorausweist, sprengt es alle Gattungszuordnungen, es ist zudem Stillleben und Interieurbild und sogar Historienmalerei. Das Gemälde ist ein Pastiche aus verschiedenen Komponenten und Zitaten. Der Junge, der das weiße, längsgestreifte Trikot der New York Yankees trägt, steht ein wenig schüchtern da, auf den „Louisville Slugger“ gestützt, den legendären, in der amerikanischen Profiliga benutzten Baseballschläger, der von der Hillerich & Bradsby Company in Louisville, Kentucky, produziert wird. Der Blick des jungen Mannes geht nicht zum Betrachter, sondern rechts an ihm vorbei, seine Miene ist ernst, die leicht nach unten gerutschte Sportsocke zeigt an, dass ihm das Posieren nicht das Wichtigste ist. Merkwürdigerweise steht der Junge nicht etwa auf dem Sportplatz, sondern in einem bürgerlichen Wohnzimmer. Eine schwere Sitzgruppe aus dunkelgrünem Samt mit Blumenmuster ist um ein zierliches Glastischchen gruppiert, auf dem ein Früchteteller abgestellt ist. Die Möbel hat Rainer Gross aus einem Warenhauskatalog abgemalt, das Früchtestillleben ist ein Cézanne-Zitat. Dass die Einzelmotive aus verschiedenen Kontexten stammen, wird gar nicht erst verschleiert. Man muss nur einmal auf die Schatten achten, die an den Möbeln in ganz andere Richtungen fallen als am Baseballschläger, während der Junge selbst erstaunlicherweise gar keinen Schatten wirft. Das Auffälligste und Beunruhigendste an dem Bild jedoch spielt sich hinter dem Rücken des Jungen ab: dort erscheint in seltsamer Doppelung, einmal etwas größer, einmal in kleinerem Format, halbtransparent und wesentlich in Weiß und Rosa gehalten, eine merkwürdige Menschengruppe. Von links greift mit kräftigem Arm eine jüngere Frau ins Geschehen ein, in der Mitte wendet ein bärtiger Alter den Kopf um, während rechts ein Engel ins Weite weist: Wie aus dem Nichts taucht im Wohnzimmer des Louisville Slugger, seitenverkehrt und wohl nach einem Stich gemalt, Peter Paul Rubens’ „Lot und die Seinen verlassen Sodom“ auf, das sich im Ringling Museum in Sarasota, Florida, befindet. Auf den ersten Blick könnte man das barocke Bild für eine etwas exzentrische Fototapete halten, doch wenn man ein wenig genauer hinschaut, fallen einem die Streifen in der rechten oberen Ecke auf, die Wolke aus Feuer und Schwefel, die den Sündenpfuhl Sodom zerstören wird. Diese Streifen greifen über die Raumecken hinweg und verhindern, dass das biblische Gemälde sich bruchlos, etwa als Wandbild, in die Komposition einfügt. Das Rubens-Bild erzeugt eine andere Bildebene, wodurch die Einheit des Gemäldes aufgesprengt wird. Das Faszinierende ist, dass sich in der privaten Verwirrung des 26-Jährigen zugleich symptomatisch eine allgemeine kulturelle Gemengelage widerspiegelt, die Ende der 70er-Jahre anfing, unter dem missverständlichen Etikett „Postmoderne“ die Kunstwelt zu beschäftigen. Es ist indes müßig, hier ausführlich zu untersuchen, was die Malerei von Rainer Gross mit der Postmoderne verbindet – erstens, weil sich selbst in den 80er-Jahren, trotz all der hitzigen Debatten, nie eine eindeutige Definition dieses Epochenbegriffs etabliert hat, zweites weil heute, nachdem auch das Ende der Postmoderne schon oft genug verkündet wurde, kein allzu großer Bedarf nach solchen Etikettierungen mehr besteht. Wenn man sich darauf verständigen kann, dass Postmoderne das ausgeprägte Gefühl der Künstler bezeichnet, dass alle avantgardistischen Schlachten geschlagen sind, dass der Graben zwischen Hochkultur und „niedriger“ Populärkultur inklusive Kitsch sich zunehmend eingeebnet hat und echte künstlerische Innovationen nicht mehr möglich sind, allenfalls noch neue Kombinationen von bereits Vorhandenem (Rainer Gross sprach vom „Recyclen“ der Bilder), dann kann man Gross’ Kunstauffassung zumindest der 70er- und 80er-Jahre getrost „postmodern“ nennen. Zu seiner Punk-Band erklärt Rainer Gross: „Sie hieß LOK (Love’s Outrageous Kingdom). Wir sind damals, 1975-77, im CBGB und Max's Kansas City mit eigenen, zum Teil von mir komponierten Liedern mit den Ramones, Talking Heads und anderen aufgetreten. Arthur Kane, genannt ‚Killer Kane’, der ehemalige Bassist der ‚New York Dolls’, gehörte der Gruppe eine Zeit lang an. Eine EP ist in England bei Fetish Records erschienen.“ (E-Mail an den Verfasser, 18.12.2011). The biggest exhibition this summer is now under way at the China Art Museum, the former China Pavilion at the World Expo 2010 Shanghai. Titled "Together: 2014 Gallery Group Exhibition," it involves an unprecedented seven exhibits simultaneously, all dealing with the style of expressionism. Paintings from Chinese and Western countries are included. "Expressionism painting was almost a spiritual base for pursuit of China's earlier education at art academies," says Xu Jiang, director of China Academy of Fine Arts and chief counselor of the exhibition. "In fact, expressionism painting echoes with Oriental implicative painting. "However, for a long time, Expressionism was attacked by the mainstream that was dominated with realism and traditional Chinese painting in the country." In the early 1980s, under China's opening-up policy, Expressionism soon emerged as a rebellious spirit. 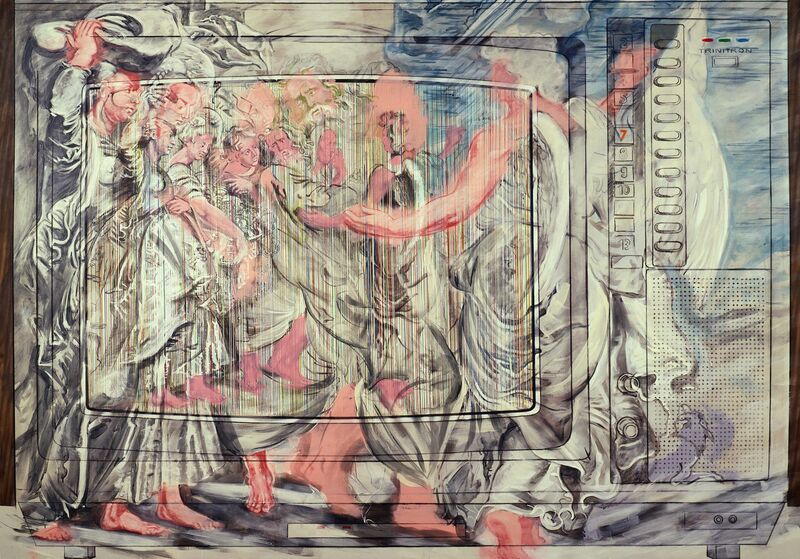 "One of the meanings of Expressionism lies in the power of observation," Xu says. "The mission of painting is actually making the invisible into the visible." 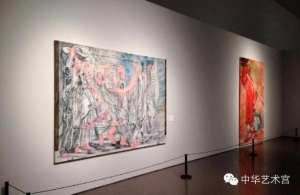 For visitors who are curious about the development of Expressionism in China or how the Expressionism trend varied in the West, this is a must-see exhibit. "Through these seven exhibitions, we are trying to build a platform for an academic dialogue between the East and the West," say Shi Dawei, director of the China Art Museum. "For example, we selected the paintings from ten masters of Chinese art history of the 20th century to unveil the implicative style with Expressionism elements in Chinese modern painting." Besides the Chinese heavyweights such as Guan Liang and Lin Fengmian, visitors will find Western masters like Ansel Kiefer and Jorg Immendorff. "Today, the digital era almost thoroughly changed our life. Only a finger touch on your smartphone or iPad opens a new visual world," says Xu. "But through these exhibitions, we want to readdress the importance of hand labor in art with a profound consideration of life and art. "Visual art is not about something that the finger slides or touches, I hope that more visitors can come and see the exhibitions here at the museum. The visual power and experience is truly hidden behind these artworks." Two of my large representational paintings from 1979 and 1982 are included at the China Museum in Shanhai.